I just had the most spectacular day. This amazing son and I spent the morning and much of the afternoon volunteering for the Special Olympics. If you want your heart to be filled with every good feeling possible, go give it a try. We sat at our registration table and enjoyed every minute of our experience. 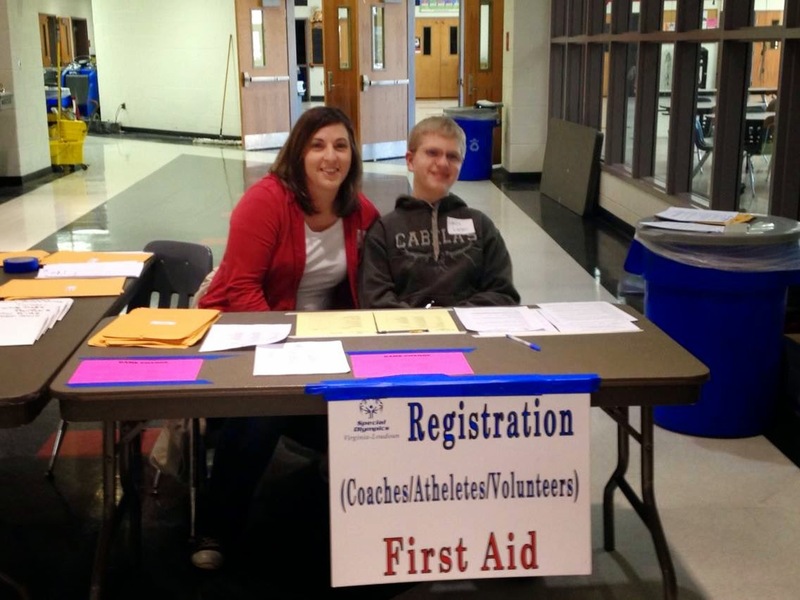 The first people to walk through the front doors of the building towards you are the volunteer coaches. You can't help but be warmed from head to toe when an energetic coach walks up to you to register his team. The coaches have given of their time and talents selflessly for weeks and weeks to prepare for this. They do so without any glory or recognition. They do so because they have a deep love in their hearts and it radiates from them. Next parade in the athletes one by one. You immediately smile meeting this enthusiastic competitors walking down the hallway towards you, decked out in their uniforms, slapping each a High 5 and ready to play in their basketball tournament. They face obstacles and challenges everyday that most people can't comprehend, and they tackle those challenges head on with the spirit of a warrior. Whether they won or lost, today was a celebration of each and every one of them. The last to enter those doors and walk your way are their parents. I feel the highest level of respect and admiration for these sweet fathers and mothers, that have been doing this journey for a decade, or two, longer than I have. While they look noticeably tired, they have an aura about them of such love, patience and tenderness that has been molded by spending a very long time in the refiner's fire. They probably don't realize that they radiate such an amazing glow, but it is obvious the minute they walk into that building. I can't leave out the volunteers - the dozens and dozens it took to orchestrate and execute such an amazing event. They all have other places to be on a busy Saturday, but they chose to be there. Their warmth and energy was so welcoming and refreshing to all. Lance and I couldn't resist taking turns sneaking away from our post to go observe the games. It was so neat to watch! Our family will have ourselves a little Olympian in the coming months when Bridger turns 8 and it was thrilling to see the amazing organization of which we are excited to be a part of. After Lance and I were finished with our volunteer shift, we went home and gathered the others to join us at another location where the son of Alan's colleague was competing on his Special Olympic basketball team. Bridger has a strooooong aversion to whistles and buzzers, so for him this did not a fun excursion make. I sat down on the edge of the bottom bleacher and parked Bridger in his wheelchair next to me. 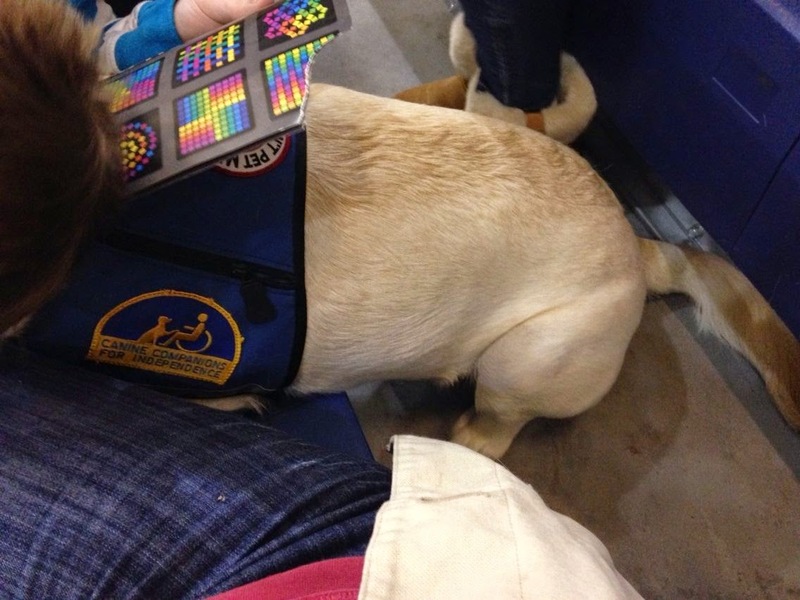 I put his service dog, Ty, in a "down" next to him. "Down" is a command that has Ty lay down, with an implied "stay" so he knows he is not to get up from that command unless told to do otherwise. Bridger was immediately asking to go sit on his dad's lap, who was sitting next to me. I lifted him out and handed him to Alan who held Bridger on his knee. The loud buzzer rang, Bridger immediately started his anxious screaming. On the other side of me, Ty immediately stood up and I commanded him "down" again. 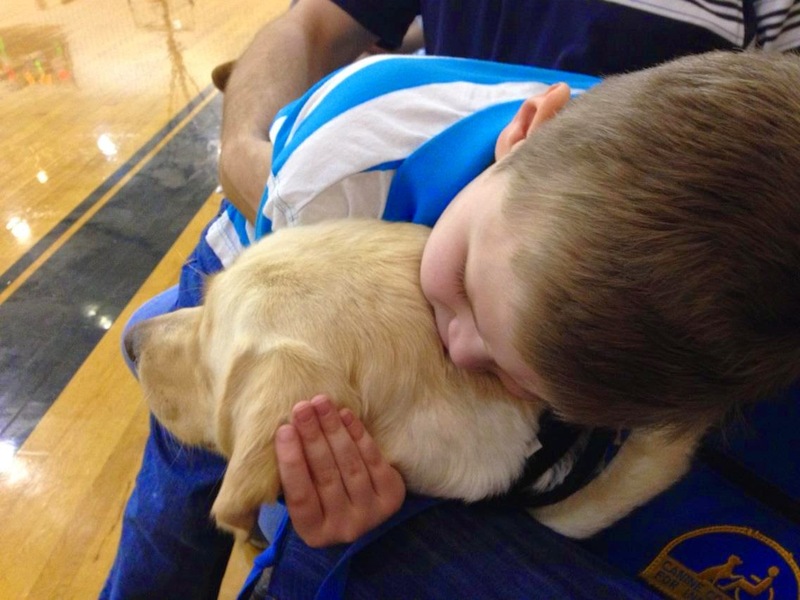 He looked at me and started feigning the motion of a "down", but as soon as I turned my head away he immediately, and awkwardly, slithered onto the bleacher behind me and perched there as he stretched his big head around me and onto Bridger's lap to comfort him. My jaw dropped at what I had just observed! Do you know how amazing that is?!! Ty, sensing Bridger's anxiety, overrode my command because he knew the job that really needed to be done and sought out Bridger to comfort him, at great discomfort to himself and knowing that a "correction" might even come as result of him getting up out of his command. No correction issued - I just marveled at what he was doing! His big bum teetered awkwardly on that thin strip of a bleacher and he held that position as long as was needed while Bridger just hugged it out with him through the loud buzzers and whistles. Eventually, we had to 'abort mission' on the game and Bridger, Ty and I walked the hallways while Alan and kids cheered on our friends. You can barely even see Ty in this picture because the space he weaseled himself into was just that small. That was also the thrill of the day, because while we were trained as a "team" with me being the "Service Facilitator" (aka Commander in Chief), it showed me that Ty knows who his ultimate partner is. It isn't me. Our typical lengthy Saturday "to-do" list was completely neglected today. In its place the most important thing happened. We celebrated Special.